I'm Matt, but I'll be frank with you for a moment. I don't like the way this chart looks. If your mind's eye is anything like mine, A) you need really good glasses and B) you might see a linear uptrend that's been intact all year and merely punctuated by volatility in the week just passed. Today's candlestick didn't have to be red. In fact, by the early afternoon, bonds were in good shape--poised to head toward the close at slightly better levels on the day and week. But as we've discussed all week, it would take a constant supply of stock market trauma to sate the risk-averse desires of bond market bulls. As it happens, stocked pulled up before crashing through Monday's lows just in the nick of time, and rates followed into the close. All of the above is much ado about nothing. I'm sorry you read it. If 10yr yields aren't under 2.66 or over 2.88, then they're effectively sideways at the highest levels in years, and at risk of breaking above this little ledge (and then running up to 3.0% before reevaluating). A few bps in either direction today didn't much matter in that sense. Even the stock bounce didn't much matter, because just as there's an obvious uptrend in yields, there's an obvious downtrend in stocks since late January. Today's bounce in stocks didn't do anything to definitively challenge that trend. 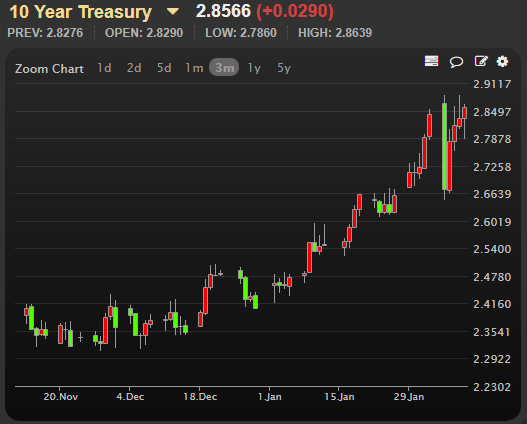 This means Monday could see it continue--something that might be good for bonds. Of course, Monday could also see today's bounce reinforced with more gains. The more time stocks spend without breaking back below this week's lows, the less likely they are to break--something that would be bad for bonds. Beyond all the stock/bond drama, next week brings the CPI report on Wednesday. It might not do much if it's close to consensus, but if it's a tenth or two off in either direction, my oh my, buckle up! Matthew Graham : "what's Friday have to do with anything?" Michael Pennington : "Liquid lunch ? It is Friday"
Timothy Baron : "Found it: v. Part-Time Employment (TOTAL) Definition Part-Time Employment refers to employment that is not the Borrower’s primary employment and is generally performed for less than 40 hours per week. Standard The Mortgagee may use Employment Income from Part-Time Employment as Effective Income if the Borrower has worked a part-time job uninterrupted for the past two years and the current position is reasonably likely to continue." Benjamin Swett : "Fannie guides allow for buyout of other title holder as rate/term if the property was owned for the prior 12 mos."